8 minute straight drive to beach with facilities! RIGHT: Description of Villa #00027. sleeps 6. 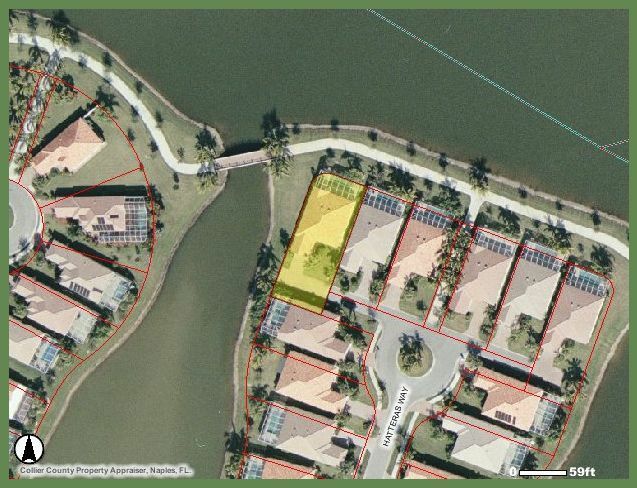 Private gated community on desirable Vanderbilt Beach Road. 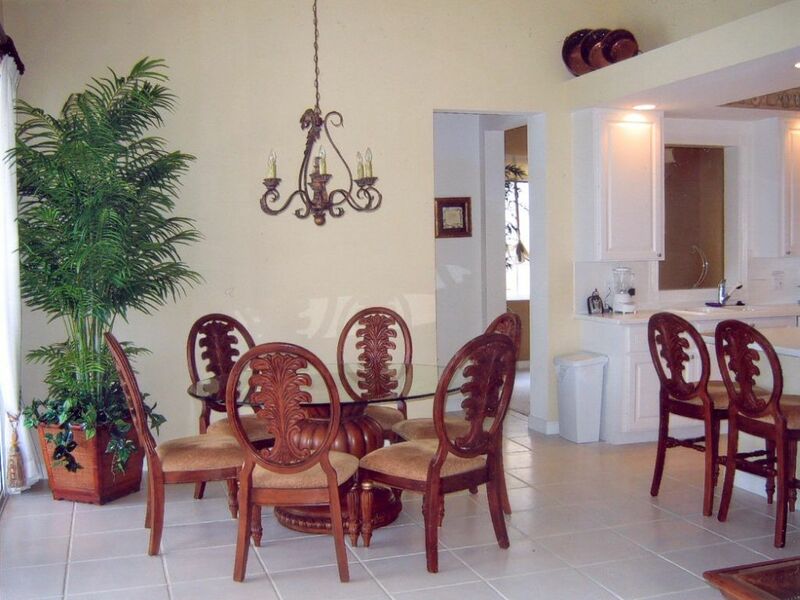 This professionally furnished Single Family Home located on Vanderbilt Beach Road (Naples) offers 3 bedrooms / 2 baths. Private pool (solar heated and screened). 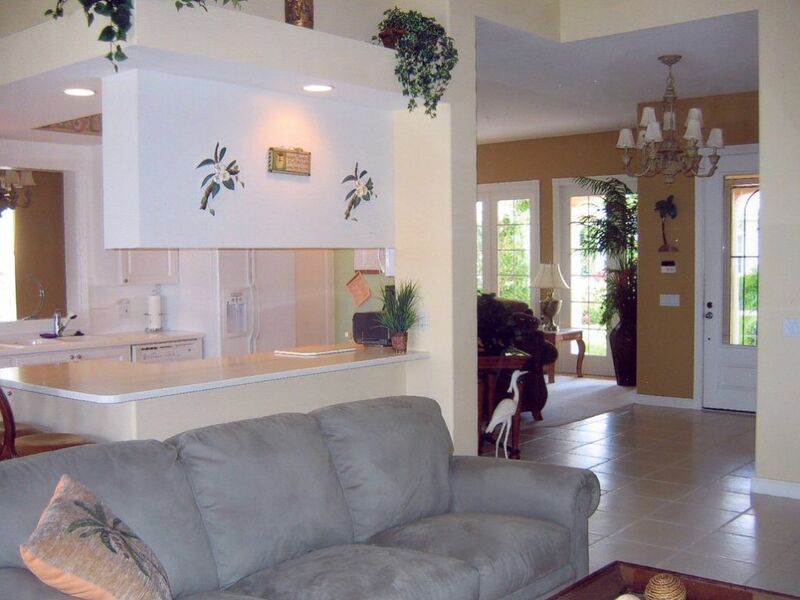 In total 2200 square feet (200 qm) under air condition. That low fence in front of the pool is normally not there. It is only installed when small children are present. Front Entrance. Covered tiled portico. 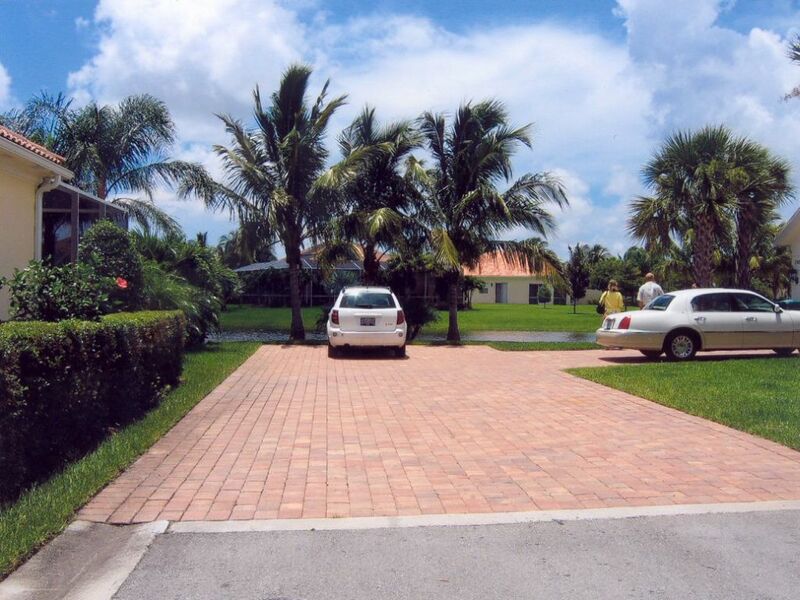 Garage for one car is available for renters and additional car can be parked on very large paver driveway. 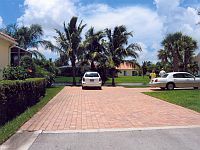 Large private paver driveway at end of block. House is to the right and not visible in this picture. 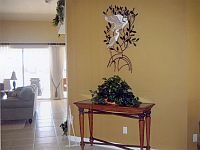 View from Foyer into Family Room. View from Family Room through Foyer into formal living room. Kitchen to the left. View from Living room through window onto covered front patio. 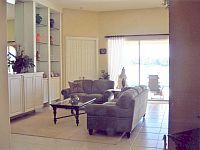 Family room or Great Room with built in TV, DVD, and stereo system. 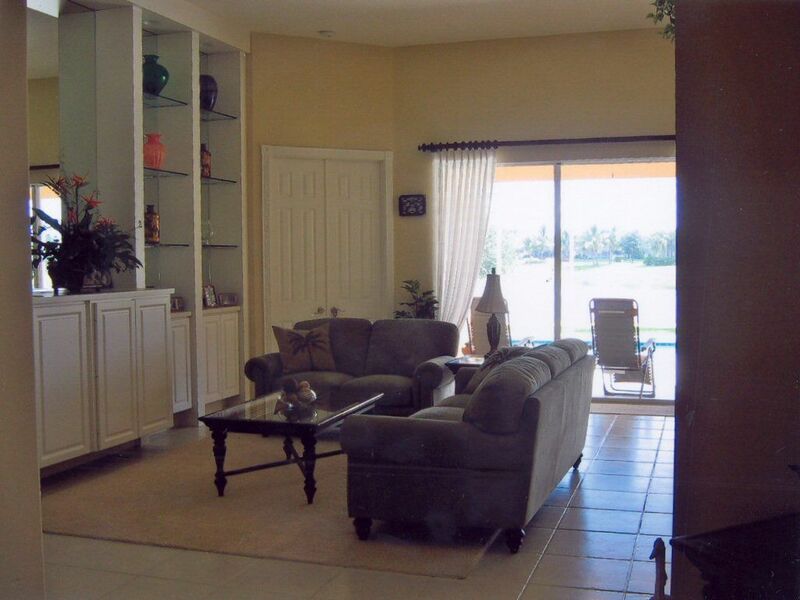 Family Room or Great Room toward rear lanai and caged pool. Family room with built-in TV. Dining area seating for 8. Additional seating at 2 large tables in pool area. 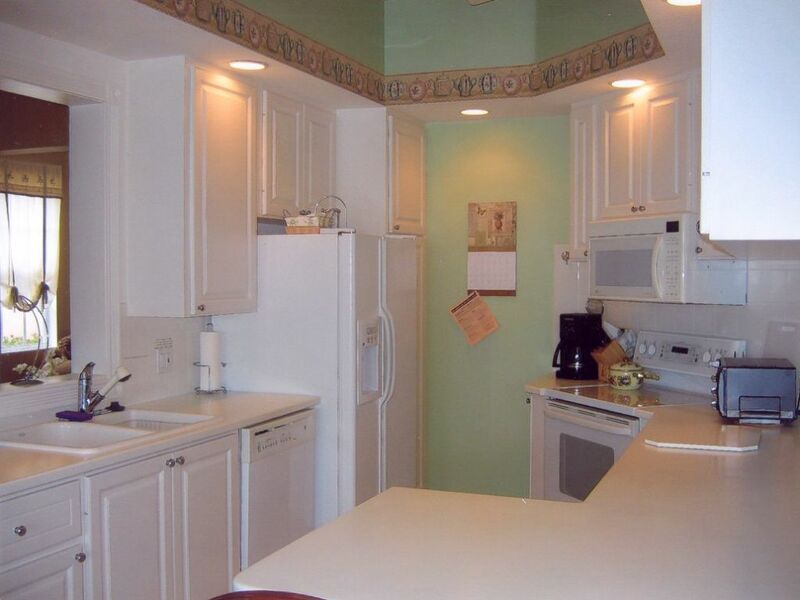 Kitchen with ceiling fan and vaulted ceiling. 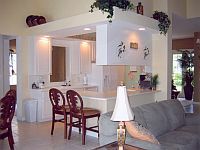 Bar in front of kitchen. Bedroom No. 1: It has a Queen size bed with rattan head board. Ceiling fan and light. Large window overlooking pool. 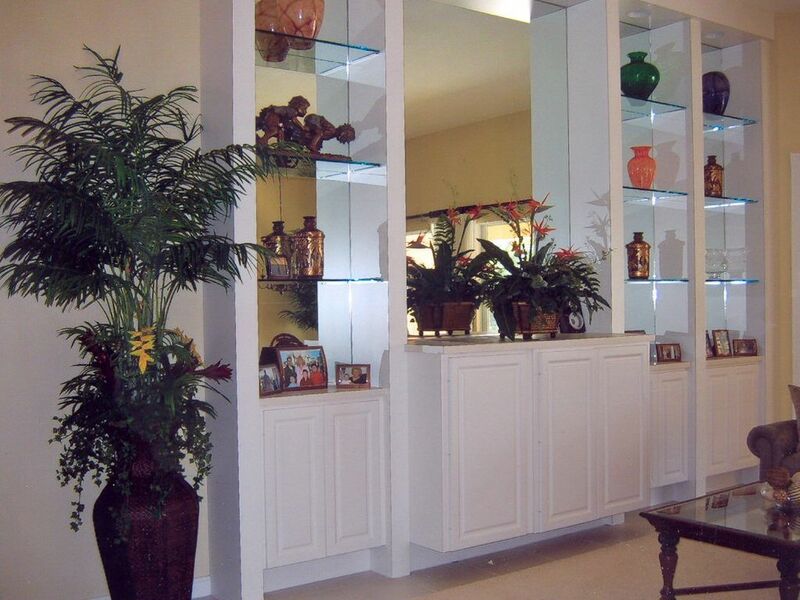 Full wall mirrored closet with all built in shelving, plenty of hangers and hanging space. New Carpeting, New bedspread. Matching rattan tall bureau with 5 large drawers, blinds, curtains, wall decor. One matching rattan large night stand with drawer and storage area below drawer. Table lamp. Clock. Phone. Cable TV. Bedroom No. 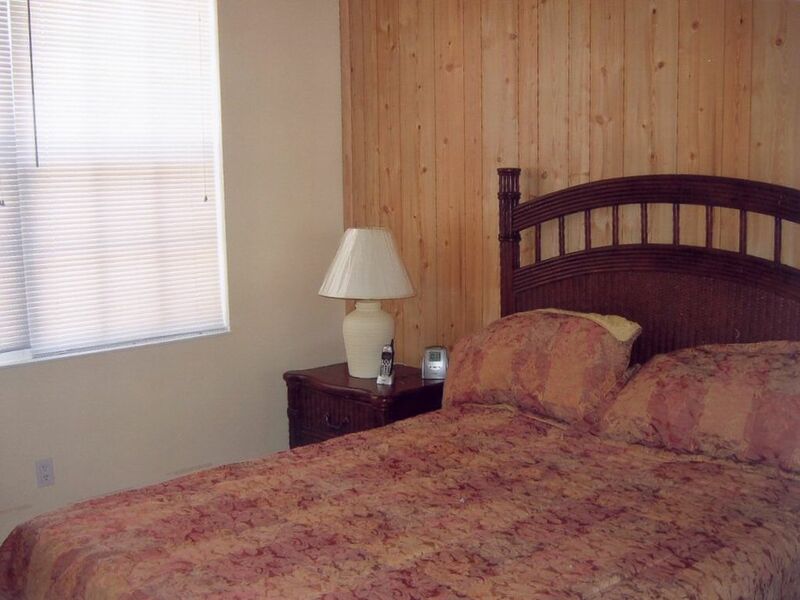 2 (No picture): It has a Queen size bed with rattan headboard and foot board. New carpeting. New bedspread. 1 matching rattan tall bureau with 5 large drawers. 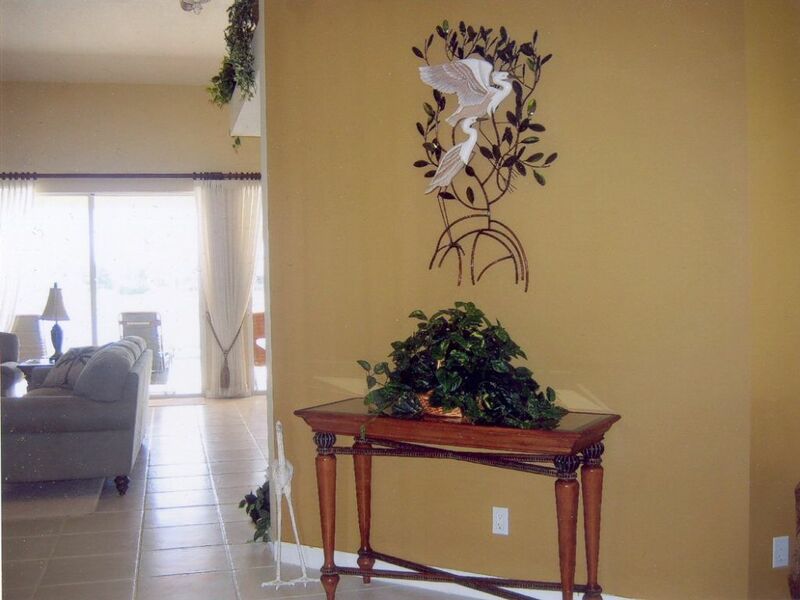 Wall decor, artificial foliage decor. Large window with blinds and curtains. Full Mirrored closet with built in shelving, plenty of hangers and hanging space. Large TV with upgraded cable connection. Ceiling fan and light. Large matching rattan night stand with drawer and storage area below drawer. Table lamp. Clock. Phone. Bedroom No. 3 (No picture): It has two Twin beds with antique gold tone head boards. Matching Ottoman at base of each bed. Wall decor. Bureau with drawer and storage area below. Table lamp. Clock. Full mirrored closet with built in shelving, plenty of hangers and hanging space. 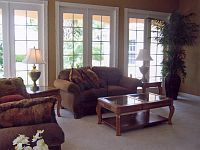 Large window with blinds and curtains. Bath of Bedroom No. 1. 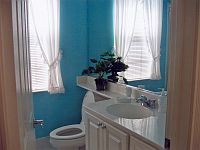 One wash-bowl, bath-tub with shower, and wc. Bathroom of Bedroom No. 2 and No. 3 no pictures. All Bathrooms have built in electric hair dryer. Lots of towels for bath and beach towels for pool and beach. 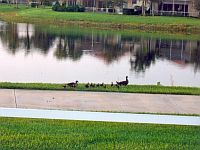 Our "Neighborhood". View from rear of home. Location of Pool Villa. 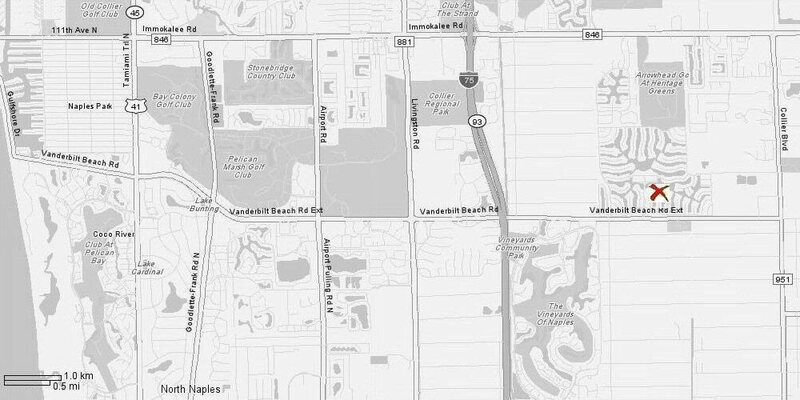 It is located in North Naples off the Vanderbilt Beach Road extension, two miles south of Immokalee Road. 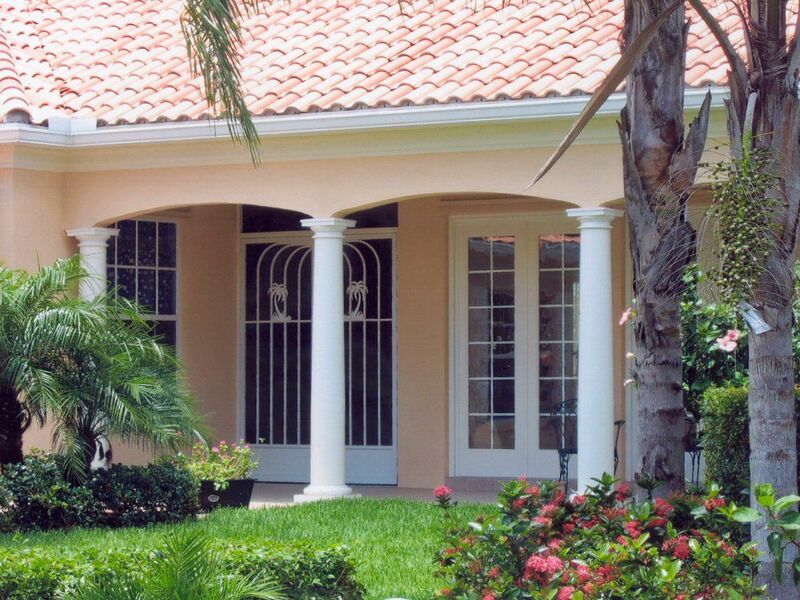 On Vanderbilt Beach Road you'll have direct access to the beaches of the Gulf of Mexico. The owner takes care of this calendar DAILY! As you can see this home has not been furnished as a rental. It is our home which we find we need to rent. We hope our renters will enjoy this very peaceful and private home with all the amenities of a world class community with lots of community activities. We expect our guests to respect our home and belongings as we have respected them by having all new and first class furnishing and equipment. We are only interested in renting by the month as a minimum. We would prefer no more than 6 to sleep. No pets. Strictly no smoking. Please keep in mind that everything in this home is brand new, purchased August 2005 and has only been used a few times by us and our family. 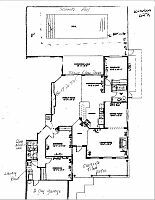 Our home has 3 bedrooms, 2 baths both with tub. 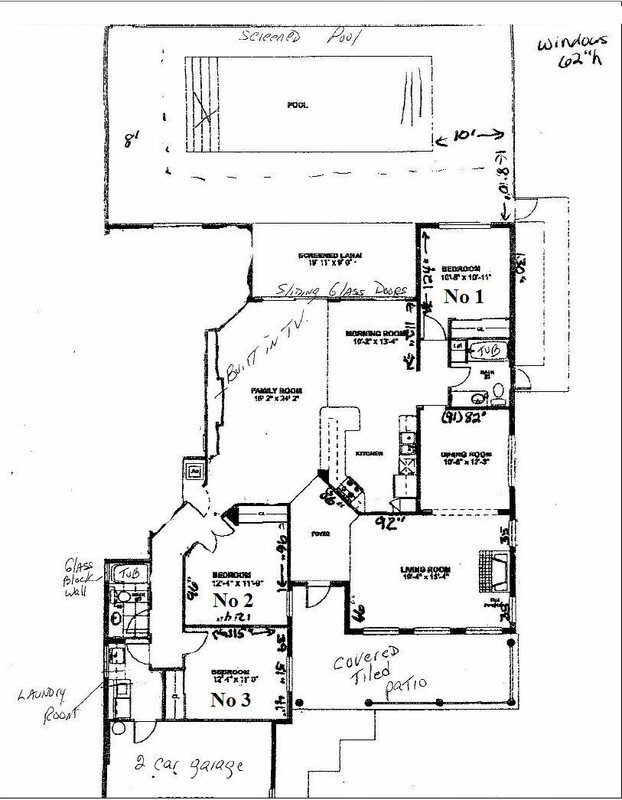 The bedrooms, dining room and formal living room are carpeted. The rest is ceramic 12" off white tile. Two bedrooms are Queens and one has two Twin beds. The Queen beds are temperpedic. The beds have only been slept in a few times. 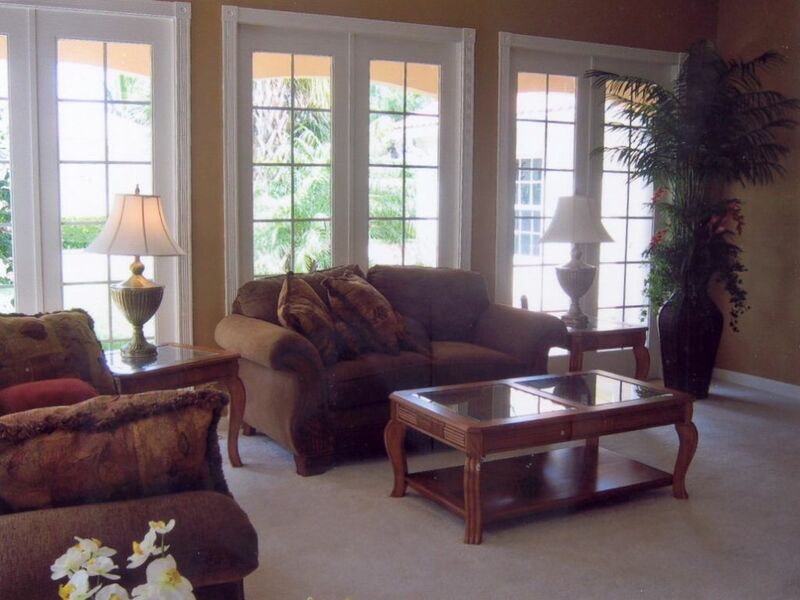 Formal living room, Dining room (which is now an office). Four telephones. 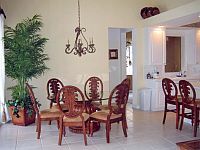 Informal Dining room off of great room with large round table and six chairs. Wide entrance foyer, Kitchen with Corian counter tops, dishwasher, and microwave. Electric stove and oven, coffee maker, toaster oven etc. The kitchen is full equiped. 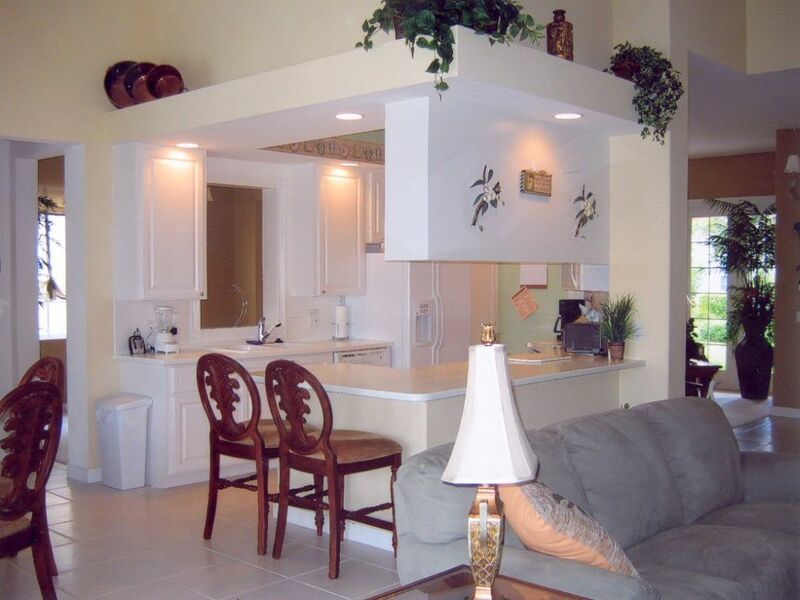 Kitchen has a peninsula with two counter height chairs. 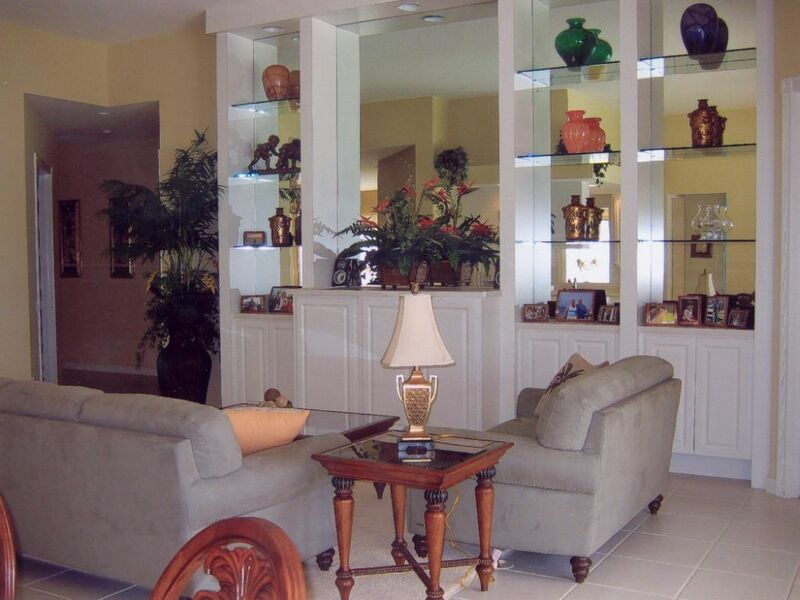 Great room with large TV and stereo CD player, DVD player, VHS player, all in pictured built in mirrored wall unit. There are three TV's in total. Since May 2008 the TV cable is upgraded. You can now see more channels and you can rent movies with the remote control. If you rent movies you will have to pay the movie charge to the owner. For $50 per month you can have High Speed Internet Access (LAN, W-LAN and Wi-Fi). Bring your own laptop/notebook with you. Laundry room with lots of storage, washer, electric dryer and large utility sink, 1-car-garage. Large in ground pool in pool cage with solar heat. Electric heat we have to charge extra. It is the largest pool in the development 30 x 12 feet. We have a pool cleaning company that takes care of it every week. Outside we have two large tables. 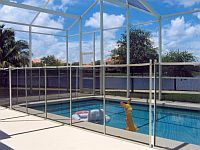 One �s �n the pool cage and sits 6. One is in the lanai and sits 4. Total seating inside and out is 18. We also have two lounges zero gravity chairs. Large gas grill. Beach chairs in garage along with cooler. 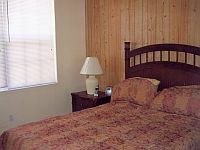 The rental fee include use of our pass to the state park beach which is 8 minute drive straight to the West. The state park beach gives free parking (with pass), lifeguards, bathrooms, showers, etc. That saves the renter from the daily parking charges that are at the other public beaches. There is a front deck area covered and tiled. Our home is on a corner premium lot so these is no neighbor on one side and is close walking distance to the town center of the community. However you cannot see or hear the town center. 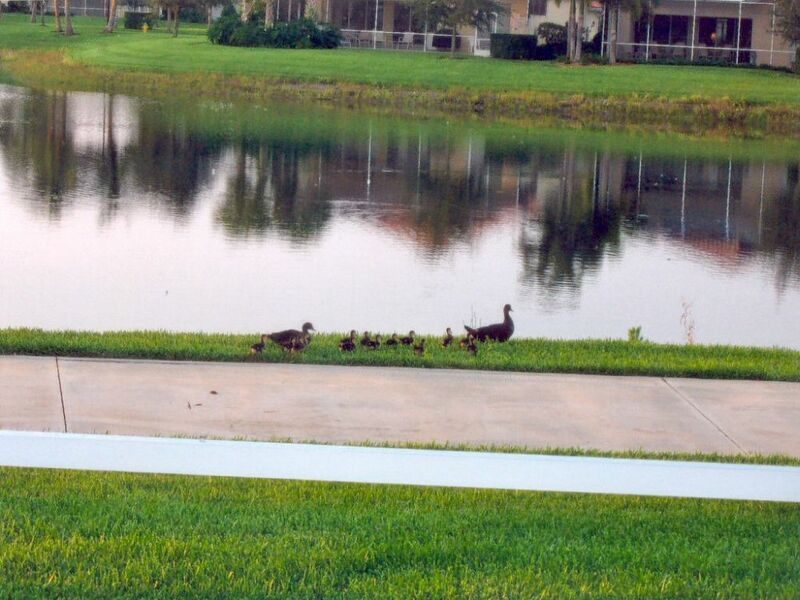 We are on a large man made lagoon with a lot of birds and rabbits in the area. You can fish the lagoon but cannot eat the fish. 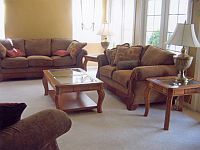 The town center has an attractive hotel style lobby, TV's, Computers, Library, Multi use rooms for card games, free movies, arts and crafts, large lagoon pool, separate lap pool, restaurant, gas station, car wash, beauty parlor, bank, nail salon, eight tennis courts, bocce court, putting green, post office, newspaper vending machines. Sorry. the fitness room can't be used by renters. World class golf course near by. 8 minute straight drive to beach with facilities!